IDA is urging the U.S. Department of Agriculture (USDA) to take immediate enforcement action against a chronic violator of the Animal Welfare Act (AWA). Nosey needs your help. 1) Use the information below to urge the agency to take immediate action to safeguard Nosey and the public. Please personalize the letter, as it will have more impact. 2) Share this information with your friends, family, and colleagues using the Facebook and Twitter buttons at the top. We’ve told you about the elephant Nosey and the exhibitor Hugo Liebel for years. Facing 33 violations of the AWA, Liebel settled with the USDA this spring and agreed to pay a meager $7,500 fine and to refrain from violating the AWA. 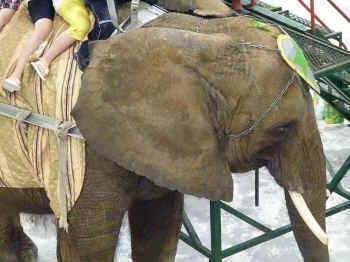 Liebel got away with a slap on the wrist, and he has resumed dragging Nosey around to festivals this summer, using her to give rides to the public. Despite the order to cease and desist from violating the AWA, IDA has documented a string of incidents in which Liebel continues to flagrantly violate federal law by repeatedly putting Nosey and the public at risk—the same violations that led to some of those 33 charges. Clearly, the pitiful fine has had no impact on Liebel—he’s operating with the same irresponsible and dangerous disregard of the law. He even told an eyewitness that he has no intention of changing his behavior! Nosey is jammed into a tiny, foul trailer with other animals and equipment in unsafe conditions. Nosey was locked inside the trailer for hours in 90 degree weather. Nosey is constantly chained or penned except when giving rides or performing tricks. Handlers monitoring the elephant rides are often distracted while talking on cell phones, or far too young to have the necessary experience to safely handle an elephant. Liebel’s two sons—ages 15 and 6 years old—both help with rides, or are solely responsible for portions of the rides. IDA is concerned that if this reckless handling continues, Nosey, or an innocent member of the public, could be seriously injured—or worse. Nosey injured a handler several years ago, and is constantly put into a position where she could cause further injury to another person, or be injured herself. IDA has filed three new complaints with the USDA in as many weeks based on reports from eyewitnesses. These complaints provided new observations, photographs, and video showing that the negligent and abusive treatment of Nosey continues unabated. And still the USDA refuses to take any meaningful action to help Nosey or ensure that the public is safe. It's time for the USDA to put an end to its bureaucratic foot dragging and file contempt charges against Liebel for violating the order by continuing to violate the AWA. The USDA must also terminate Liebel’s license and confiscate Nosey. Thanks to you, our previous alerts have resulted in avalanches of emails on Nosey’s behalf. Please take a few minutes to help again.